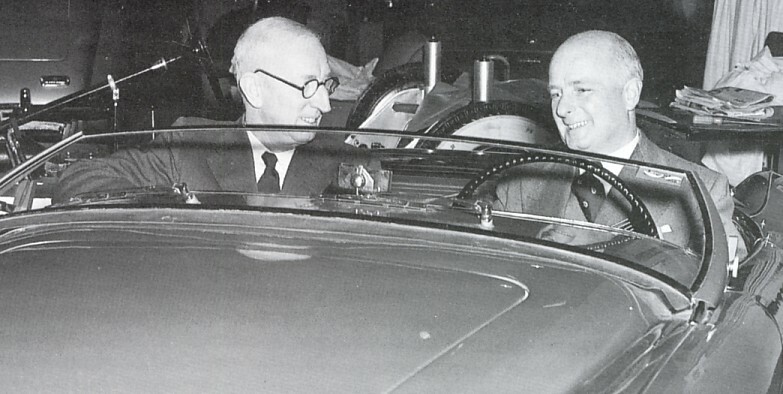 When the car arrived at the show it was called the Healey Hundred but the evening before the official opening, Leonard Lord, Chairman of Austin saw the actual car and the reaction to it, and he was immediately impressed by its potential. He met Donald Healey and that evening a deal was done in the Dorchester Hotel. Austin-Healey was born and the rest is history as they say. Gerry Coker was instructed to design a new badge which was quickly made up by a Birmingham jeweller. And what a great design job he did in such a short time. 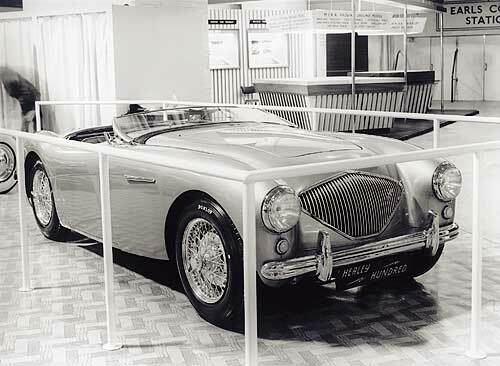 In October 1952 at the Earls Court Motor Show in London, Donald Healey, of the Donald Healey Motor Company of Warwick, stunned the British motoring world with the introduction of the Austin-Healey 100. The sleek car caused so much excitement that barriers were erected to keep back the crowds. It's flowing lines were the work of Gerry Coker, inspired by the Italian styling he greatly admired. The ultimate incarnation of the 100 model was the 100S. This was a specialist racing vehicle with a long list of upgrades including an all alloy body, 4 wheel Dunlop disc brakes, strengthened chassis, modified close ratio C series gearbox and alloy head, amongst many others. Output was raised from the standard car`s 90 bhp to 132 bhp. Only 50 100Ss were produced in addition to 5 special test cars, consequently they are extremely desirable. If you can find one for sale expect to pay $500,000 and more to acquire it.. The engineering design was mainly the work of Donald's son Geoff Healey and was mounted on a chassis designed by Barry Bilbie. The car was named the Hundred because of its ability to exceed 100 mph, an important selling point at the time. The car was an immediate success with 3,000 orders being taken at the show alone, up until then Healey had never made more than 200 cars a year! The car was very popular with club racers and was also campaigned by Austin-Healey. It went on to spawn the 100M, which was a factory modified BN2 with high compression pistons in addition to the other bits of the `Le Mans` modification kit that was available as an after market upgrade package for enthusiasts. The official number of factory produced 100Ms is now accepted to be 640. An unknown number of vehicles were fitted with the after market option kit, and in fact cars are still being fitted with modern replicas of it. It was powered by the mundane, 2,660 cc push rod, four banger used in the ill fated Austin Atlantic, but also found in taxis and dump trucks! Despite this the Healey could still sprint from 0 to 60 mph in around 11.5 seconds, although the use of a specially prepared car resulted in Autosport obtaining the very flattering time of 10.3 seconds - never replicated by any production model. Blair Harber (AHCA Southern Ontario) .